The villa consists of 3 levels, on the lowest level with its own entrance, it has a living room, large bathroom, bedroom, gym, and two rooms that are used for storage which are locked (private). The ground floor has a large entrance that leads to the kitchen and dining area, an office (18 m2) that can be used as a bedroom (if needed) laundry room, bathroom, also a very comfortable lounge with three sets of patio doors that lead out to pool area. The upper floor has 5 large bedrooms, the master bedroom (bed 180x210 cm) is equipped with its own private walk-in closet and bathroom. One bedroom with 160x200 cm bed, two bedrooms with 120x200 cm beds in each room and one bedroom with bed 90x200 cm. Two of the bedrooms are over looking the pool area. The upper floor also has a second bathroom and a TV lounge. 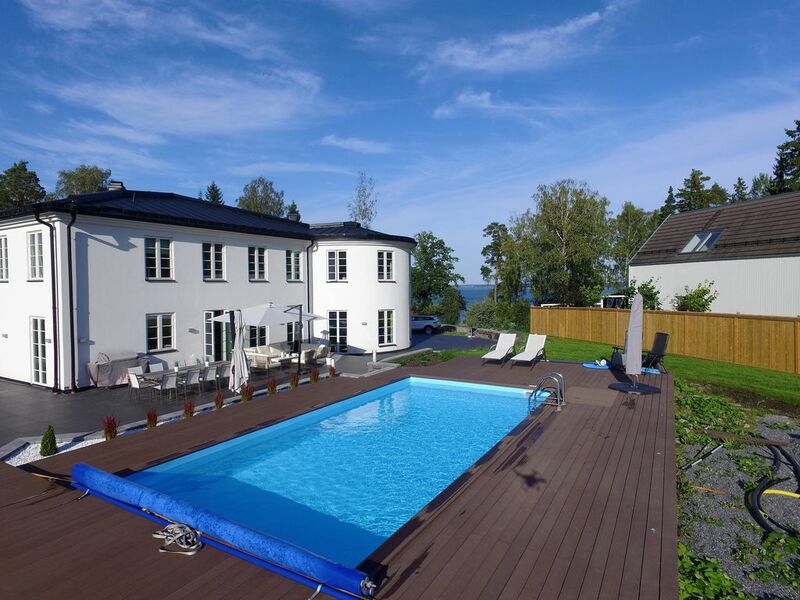 The villa is located in 3600m2 with breathtaking surroundings and seaview, the Baltic Sea is almost at the doorstep. Vi må imidlertid påpeke at plottet fortsatt er landscaped, selv om den bakre del af plottet er fuldstændig med undtagelse af poolhuset, der venter på at bygge. We enjoyed a wonderfully relaxing 10 day break in this lovely home on the island of Resaro. The owners were so welcoming and provided everything we needed, taking the time to show us around their home and the local area. The house itself is within sight of the sea on a very quiet lane and the garden and pool provided plenty of room for our boys to enjoy themselves. The island is tranquil and we enjoyed being able to explore the area by bike. There is a very useful mini supermarket only 5 minutes away by bicycle where you can get most things you need. The nearest local town, Vaxholm, happens to be the central hub of the Stockholm archipelago. We drove there by car in less than 10 minutes and visited a number of times by bicycle where the super-frequent car ferry enables you to explore Rindö and Scarpö. There's a great restaurant at the far end of Rindö and lots of quiet swimming spots on both islands should you fancy a dip. One of the best experiences was hiring kayaks from the canoeing centre only a mile away. It's a stunning area and especially attractive from the sea. The house is lovely. Plenty of space, very comfortable and very well equipped for any family. We would highly recommend Shayne and Anna's very special home, not least because they are so keen that you enjoy everything Stockholm has to offer. Resarö island is a beautiful island where you can easily walk around (9 kilometers on the north part) and where is a boat rental where you can rent kayaks and canoes. We have five bicycles tenants can borrow. There is also a tennis court 400 m from the house, tickets are being bought at the local food store "Ica" at the island.